We have not been snapping as many pictures lately since Alex was sick (diarrhea and then an ear infection). Now it is time to catch up on some photos of Alex at four months. 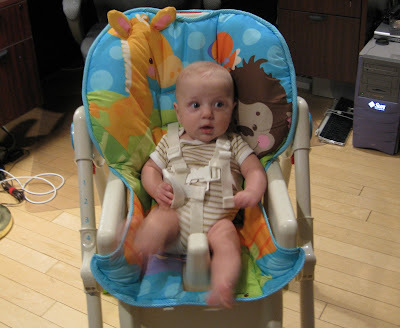 John put together Alex's high chair this week. (We have been fortunate to receive wonderful baby gifts from family and friends!) He really likes sitting in the chair and he was able to sit in it at the table while we ate dinner the other night. 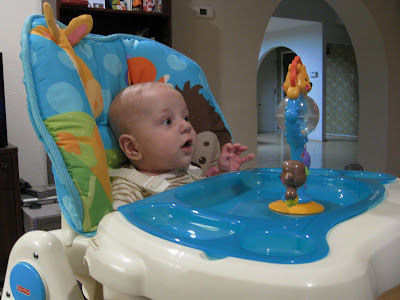 He will get to use it later this weekend for his first taste of rice cereal. 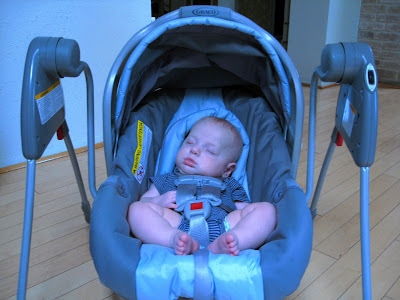 I snapped a photo of him on Friday afternoon sleeping in his swing. He will take some long naps in the swing. 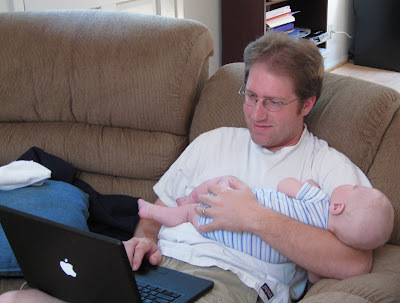 When Mom and I came home from Costco today, we found Alex sleeping in John's arms while he worked from his laptop.